Let’s face it, not everybody is comfortable wearing autumnal shades like deep plums and oxbloods. So, we’ve created a four-floor chart that will help you up your game from nudes and baby pinks and climb higher to daring shades of reds and maroons. This list of the hottest shades available on beauty shelves, could also easily double up as your check-list. You can thank us later! Click on the image to view in larger gallery. First Row – Dior Addict in Tribal 451, Givenchy Le rouge, Lancome 197 in La Garance, Chanel Rouge Coco Shine in Energy, Clinique in Pop+Holiday, Urban Decay Matte Revolution in Bad Blood, Guerlain Kiss Kiss Creamy Satin Finish Lipstick in Red Hot 328. 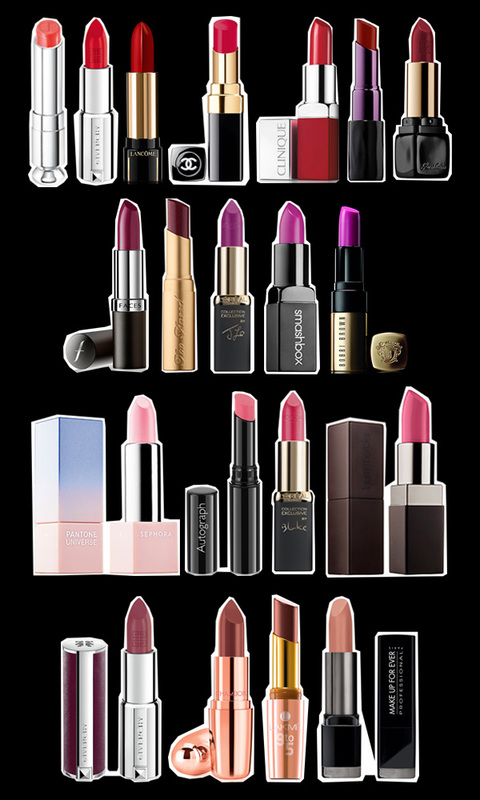 Second Row – Faces Ultime Pro Velvet Matte in Say My Name, Urban Decay Matte Revolution Lipstick, L’Oreal Paris La Vie En Rose in Jennifer Lopez’ Moist Matte Delicate Pink, Smashbox Be Legendary Cream Lipstick in Vibrant Purple, Bobbi Brown Luxe Lip colour. Fourth Row- Givenchy Rouge Couture in 207, Chambor Orosa Lipstick in 583, Lakme 9To5 in Tea Break, Make Up Forever in Rouge Artist Intense.